The R9s with the adjustable clubfaces are among my favorites. It took me a little longer than most people to get on the bandwagon of an adjustable clubface because I was a purist and thought "You fix your swing, not your club." But that was short-sighted because the pros have been getting clubs fitted to their swings for years. To be more precise, I should say the hosel is adjustable, not the clubface. This TaylorMade Lady R9 Fairway wood's adjustable hosel allows you to change the lie and loft angle to eight different settings. It has FCT (Flight Control Technology), which will give you up to 36 yards of variance. For you high handicappers struggling with a slice, adjust the clubface more closed. As your swing improves, adjust it back to neutral. Another great feature of this fairway wood for you ladies is the super-light 70-gram shaft with the High Inertia Tip. I really like this shaft for slower swing speeds because (obviously) of the light weight, but also because it promotes higher ball speeds that will get the ball flying higher and longer. For those of you looking for an even more game-improving fairway wood, check out the TaylorMade Lady Burner SuperFast Fairway Wood. 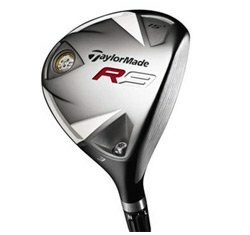 This is the biggest clubhead on a fairway wood you will find.